The Book Cellar and author Chris Abani (The secret history of Las Vegas) welcome Emmy nominated writer/producer Kirker Butler (Family Guy) for a discussion of his new novel, Pretty Ugly. Satire always guarantees two things: laughter and offense. Kirker Butler’s debut novel, Pretty Ugly serves up both in equal measure. Doing what satire has done for centuries, Butler’s novel slyly turns the mirror on ourselves. It’s really funny, but it’s also Pretty Ugly. A bright new voice in satirical literature, Pretty Ugly pulls no punches as Butler dissects our culture’s current state of affairs. Kirker Butler is an Emmy nominated writer and producer. His TV credits include Family Guy, The Cleveland Show, and The Neighbors among others. His latest show, Galavant, premiered on ABC Television in January 2015. Butler is also the writer of the graphic novel, Blue Agave and Worm. Kirker grew up in Kentucky, and now lives in Los Angeles with his family. CHANGE OF VENUE! This event will now be held at The Book Cellar. Books will be available to purchase at the event, and there will be a signing opportunity after the conversation. Christopher Abani (or Chris Abani) (born December 27, 1966) is a Nigerian author. Abani's first novel, Masters of the Board, was about a Neo-Nazi takeover of Nigeria. The book earned one reviewer to praise Abani as "Africa's answer to Frederick Forsyth." The Nigerian government, however, believed the book to be a blueprint for an actual coup, and sent the 18-year-old Abani to prison in 1985. After serving six months in jail, he was released, but he went on to perform in a guerilla theatre group. This action led to his arrest and imprisonment at Kiri Kiri, a notorious prison. He was released again, but after writing his play Song of a Broken Flute he was arrested for a third time, sentenced to death, and sent to the Kalakuta Prison, where he was jailed with other political prisoners and inmates on death row. His father is Igbo, while his mother was English born. He spent some of his prison time in solitary confinement, but was freed in 1991. He lived in exile in London until a friend was murdered there in 1999; he then fled to the United States. He is a Professor at the University of California, Riverside. His most recent book of poetry, Sanctificum (Copper Canyon Press, 2010), is a book-length sequence of linked poems, bringing together religious ritual, the Igbo language of his Nigerian homeland, and reggae rhythms in a postracial, liturgical love song. Chris was recently hospitalized in Los Angeles for food poisoning, on the same day he was scheduled to speak at the Central Library in that city. Chris Abani is currently considered a "single author." If one or more works are by a distinct, homonymous authors, go ahead and split the author. 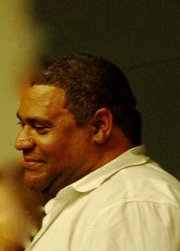 Chris Abani is composed of 4 names. You can examine and separate out names.